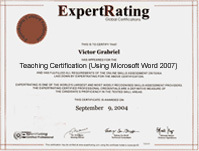 (leading to ExpertRating Teaching Certification-Using Microsoft Word 2007). This course is vital for today's teachers who have to produce and achieve so much in so little time. Join us and find out how to turn this dynamic program into a launching pad for creative lesson plans and engaging classroom activities. About the ExpertRating Online Teaching Course (Microsoft Word 2007) instructor : Robin Sellers holds a current teaching license. She has a Master of Arts degree in English with a concentration in technical and professional communication and a Bachelor of Arts degree in English with a certification in secondary education. Since 1995, she has taught at the secondary and post-secondary level. She encourages creativity in her classroom, teaches traditional curriculum classes in a computer lab, and incorporates technology including the Internet in her lessons. She also develops and teaches online curriculum courses. In 2003, she began teaching continuing education courses for teachers. Teaching Microsoft Word 2007 in the Classroom requirements: For taking this instructor led ExpertRating Online Teaching Course (Microsoft Word 2007) you need Microsoft Windows Vista or XP, Microsoft Word 2007 or Microsoft Word Home and Student Edition 2007 or Microsoft Office 2007 or Microsoft Office Home and Student Edition 2007. A free trial version may also be available at Microsoft's Web site. Software must be installed and fully operational before the course begins; Internet access, e-mail, and the Microsoft Internet Explorer or Mozilla Firefox Web browser. Note: This course is not suitable for Macintosh users. "I thank you for your expertise, patience, and most of all your sense of humor in making this a most enjoyable learning experience. Your lessons have been most useful in all of my classes and the new learning experience is flowing over to my students. Further, I have enjoyed this course and learned new and very useful lessons to encourage my students to learn more and to be more creative." "Robin is a great instructor. She created step by step lessons to explain the many tools in MS Word 2007. This was a great, easy to follow course with lots of good ideas and practical applications." "Thank you Robin for a great course! I now feel more comfortable and excited about using Word 2007. I really would like to take your Excel 2007 course. I'm glad you are offering these classes. I will see you soon! Thank you again." ExpertRating is one of the world's only ISO 9001:2015 Certified companies (from TUV America) offering an Online Teaching (Microsoft Word 2007) Course (leading to ExpertRating Teaching (Microsoft Word 2007) Skills Certification). When you choose the ExpertRating Online Teaching Course (Microsoft Word 2007) you can be sure that you are buying a premium International certification that is recognized by hundreds of employers and Government bodies in the US and other countries. With ExpertRating you get certified quickly online and you are equipped with a store house of information through the in-depth ExpertRating Online Teaching Course (Microsoft Word 2007) Courseware which has been developed by experienced Soft Skills Teaching Experts. The ExpertRating Teaching Certification (Using Microsoft Word 2007) is by far the best value for money instructor led Teaching Program at $129.99. You can buy this ExpertRating Online Teaching Course (Microsoft Word 2007) leading to Teaching certification at a special offer price of only $129.99 which includes the in-depth ExpertRating Online Teaching Course (Microsoft Word 2007) Courseware and exam fee. This is the best value for money Teaching Program available till date. You get the following services within the USD $129.99 fee. In-depth ExpertRating Online Teaching Course (Microsoft Word 2007) Courseware including scenarios and case studies. The process of getting yourself certified is very simple. All you have to do is buy the ExpertRating Online Teaching Course (Microsoft Word 2007) for $129.99. Log in to the instructor led course using your password. Go through the ExpertRating Online Teaching Course (Microsoft Word 2007) Courseware (which would take you 6 weeks) and complete the final Teaching Certification exam at your convenience. You can complete the exam within 2 months of buying the Teaching Certification. The result of the exam appears as soon as it is completed, and your Teaching Certificate is mailed immediately. The final exam is fully based upon the ExpertRating Online Teaching Course (Microsoft Word 2007) Courseware that is provided along with the Teaching Certification. If you have gone through the courseware properly you should not have a problem clearing the exam. The exam consists of multiple choice questions from all chapters of the ExpertRating Online Teaching Course (Microsoft Word 2007) Courseware. Microsoft Word 2007 gives better results than other applications with the help of Microsoft Office Fluent user interface. Microsoft Word is a software package which is used to type letters, reports, and other information. You can use your home as well as office computer for desktop publishing using this application. Microsoft Word has an in-built spell checker, thesaurus and dictionary. MS Word can help you perform some calculations with some of the formulae that it supports. Word also offers password protection and can only be opened with a password if you desire. If the password is set, the others can only open it as a Read-Only document. Microsoft is a useful tool for businessmen, content developers, teachers and students alike. Apart from the above mentioned features, Microsoft Word also contains a wide array of charts, quick formatting tools, a number of fonts to suit your needs and SmartArt diagrams. The ExpertRating Microsoft Word 2003 in the Classroom Certification helps you render a professional look to your documents. In this first lesson, you'll discover Word 2007's navigation principles and its indispensable new tabs. This lesson will also go over the basic editing features that will allow you to dive into more complex word processing feats and teach your students the ins and outs of this powerful program. Letter writing is a great skill to teach your students in any discipline, so in this lesson you'll use Word to format a letter. You'll also find out how to use keyboard navigation for document shortcuts. You'll make your life in the classroom a whole lot easier by putting this lesson to use right away, and you'll learn about some great letter-writing lessons for your students, too. Get ready to take your first steps toward becoming an organized Word user! In this lesson, you'll learn how to save, resave, and relocate documents to different drives on your computer. You'll go through the process of saving files so that you can teach your students how to do it correctly. How many times have you wished you'd caught a spelling error that slipped by? Well, with Word's spell check, you'll never have that problem again. In this lesson, you'll look at some more productivity tools, like spell and grammar check, cut and paste, and file deletions. Then, you'll learn how you can teach these time-saving tools that will make working with Word—and writing in general—much easier for your students. Fonts, formatting, and WordArt, oh my! In this lesson, you'll start spicing up your work with these fun Word tools that let you put your unique stamp on classroom and personal documents. You'll have the tools to teach your students to create book report covers, poster projects, and much more. Surprisingly, you have a lot of options when it comes to document printing and adding clip art. This lesson will take a look at smart ways to navigate through these choices. Word lets you preview everything you print, which is really helpful for catching any errors before it's too late. And clip art will open up a whole new world to you—enabling you to make your documents more visually friendly to young learners. In this lesson you're going to master setting margins, headers, and footers. You'll learn about adding page numbers, changing your margins to fit different document needs, and adding borders to give classroom documents a little extra flair. In this lesson, you'll take a closer look at your document and examine how to format paragraphs and make lists with bullets and numbers. This lesson will also take a quick tour of indents, which will help you easily fix tricky spacing. Let Word's drawing features dazzle you as you find out all the neat things you can do with AutoShapes—like filling them with colors and pictures to help you illustrate your document. With all the shapes available in Word, you'll have no shortage of creative inspiration, and at the end of the lesson, you'll have a student of the week poster to use in your classroom. Creating tables in Word allows you to do all kinds of useful things such as present charts, math problems, and other information in creative and visually appealing ways. Word offers a lot of flexibility in table design, including specifying cell height and width, color formatting, and sorting functions that will make your table pop! You'll see how it all works in this lesson and you'll use Word's table feature to create a class grade roster. In this lesson, you'll learn all about Word templates. A template is a pre-formatted document that you'll be able to use over and over again for specific purposes—things like lesson plans, quizzes, grades, posters, and more. As a teacher, you'll find that templates can save you a great deal of time. You'll also see how Word's language tools can increase student vocabulary and how you can use track changes to incorporate group writing and revisions into your classroom. You'll finish the course with a final look at finding and organizing files. After this lesson, you'll never misplace a Word document again! You'll find out how to organize folders and search for files so that saving and retrieving what you need becomes a breeze.